A TB patient at Tomsk Regional Clinical Tuberculosis Hospital, Building #3. Photograph and caption © James Nachtwey/VII. “Tuberculosis is a disease of poverty and stress“. Merrill Goozner, The Center for Science in the Public Interest. “Sixty percent of all new cases of tuberculosis have resulted from the rapid growth of the post-Communist prison archipelago”. Tuberculosis (TB) was under relative control in the former USSR. Soviets had lifestyles, nourishment and conditions of living that kept disease at bay. When communism fell, so did a civil order in many areas. The phalanx of activity that filled the vacuum involved new systems, new relationships, new businesses and new criminal opportunities. The prisons filled in a society that needed to organize itself before it could organize it’s transgressors. The prison population swelled to 1.1 million (it is now down to little over 700,000). Post-communist prisons held malnourished, crowded populations with weak immune systems; they have been described as ‘Tuberculosis incubators‘. TB is best treated with various labour intensive methods known under the umbrella-term Directly Observed Therapys (DOTs). Due to TB’s many different strains – each with different drug resistancies – case by case treatments differ according to patient reactions to drugs. At the least, a patient must be observed and his/her drug regime modified over a 6 month period. For Multi-Drug-Resistant Tuberculosis (MDR-TB) the treatment can take as long as two years. And, MDR-TB & XDR-TB are increasingly common among prison and civilian populations of Tomsk and other Siberian urban centers. Unfortunately, closely monitored drug regimes are improbable in over-stretched and poorly funded state systems. It wasn’t always so dire. 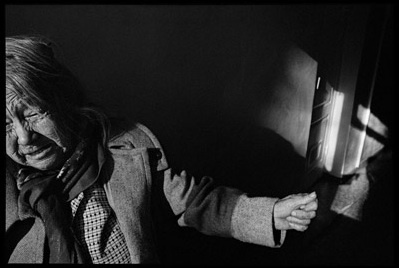 The former Soviet provided a regular supply of drugs to abate disease amongst its prison population, but those supplies were interrupted in the fall of Communism – sporadic and incomplete treatments gave rise to multiple resistant strains of tuberculosis. To compound this the side effects of drugs were enough to discourage patients, and rarely, if ever, did courses of treatment go with a prisoner into his community following release. James Nachtwey‘s mega-promoted TED prize crusade addresses the spread of Extremely Drug Resistant Tuberculosis (XDR-TB), its mutant forms and human tolls. This excellent Guardian article notes Nachtwey has photographed the epidemic worldwide, from Siberian prisons to Cambodian clinics. Nachtwey stands with Sebastião Salgado in the “super-photographer” stakes. They both make the ugly beautiful. Both Nachtwey and Salgado have inspired others to action and both believe firmly in the power of photography to change existences … even in a time when such sentiment is derided as old-fashioned, false idealism. But, despite the odds, Nachtwey has succeeded in forcing his work into the conscience of millions. For some his work is an inspiration for social justice; but for others his work is a sub-conscious default to guilt, despondency and powerlessness to help others less fortunate. James Nachtwey puts human faces to global suffering. And we are outraged. Or we feel we should be outraged. I think Nachtwey wants us to believe in ourselves as agents of change. Nachtwey deliberately chose Tuberculosis – because while the situation is critical, it is not terminal and TB is theoretically entirely curable. Beating TB on a global scale is dependent on the behaviours of individuals and their communities. Correctional Treatment Unit #1, a TB prison colony in Tomsk, Siberia. A prisoner proves to a nurse that he has swallowed his daily oral TB medication. The prisoners receive treatment through metal bars in order to give security to the nurses. Treatment is supervised by Partners in Health in partnership with the government TB program. © James Nachtwey/VII. Nachtwey’s work extended beyond the prison walls in Tomsk and went into the public clinics (some images included here show those facilities); TB is no respecter of human walls or demarcations. Regional, economic poverty will spike rates of TB. The worst thing we could do here would be to think that TB is a disease of other nations and other peoples. In Pathologies of Power (2004), Paul Farmer wrote about the New York prison system’s huge Tuberculosis epidemic of the mid-nineties, “By some estimate, it cost $1 billion to bring under control”. The strains that arose in the NYDoC have been directly related to the resistant strains of the former Soviet Union. Tuberculosis is latent within one third of the world’s population. Tuberculosis needs only the conditions for its growth. Prison Photography blog has focused twice previously on photographers’ responses to the USSR and its aftermath – the Gulag and the new prisons that arose. While Anna Shteynshleyger and Yana Payusova are working with very different issues, regions and populations they – along with Nachtwey’s work – remind us of the severe problems facing parts of modern Russian society. Unfortunately, and certainly in the case of Tuberculosis, these problems exist in other nations also. Nachtwey focused on TB because it was not – despite being a global problem – on the radar of most people. That sounds like something I’d say about prisons and prisoners’ rights. For more information on XDR-TB read the Action – Advocacy to Stop TB Internationally website, and the Center for Disease Control & Prevention website. For the most accessible and recent article, read Merrill Goozner’s 2008 Scientific American article about Russian Tuberculosis strains which also includes a audio segment with a clear explanation of the situation. 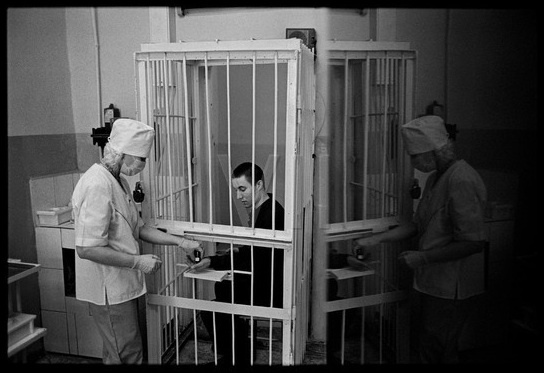 A TB patient/prisoner receives his daily oral medication at Correctional Treatment Unit #1, a TB prison colony in Tomsk, Siberia. © James Nachtwey/VII. James Nachtwey built his reputation as a combat photographer. He was always reluctant to be the focus of media attention but after 5 Capa Gold Medals for War Photography he couldn’t escape the curiosity of Christian Frei who made the extraordinary film War Photographer. Nachtwey comes across as an articulate, self-isolated journalist-force devoted to his craft and courteously distant to others; here is a clip. Nachtwey has done interviews here, here and here. Read an interview about his 9/11 pictures, and associated videos on Digital Journalist. The images were published in TIME. He worked in Rwanda for his book Inferno. View his TED Prize acceptance speech and the consequent October 2008 launch of his XDR-TB project and Flickr pool.